Funeral services for Judith F. Hagen will be held at 10:00 AM on Saturday, April 14, 2018 at the Zion Lutheran Church, Albert Lea. The Reverend Robert Stohlmann will officiate. Visitation will take place one hour prior to the service at the church. Interment will be in Graceland Cemetery. Judy passed away on Wednesday, April 11, 2018 at Lakeview Hospital in Stillwater, MN. She was 80 years old. Judith Fay (Wetterling) Hagen was born on August 16, 1937 in Mason City, IA to Erwin and Lillian (Boehnke) Wetterling. She was raised on a farm outside of Miller, IA, and graduated from Ventura High School in 1954. She continued her education at Luther College and then Waldorf College in Forest City, IA. On July 18, 1958, Judy was united in marriage to Richard Dean Hagen in Garner, IA. The couple would move to Albert Lea where they would continue to be lifelong residents. 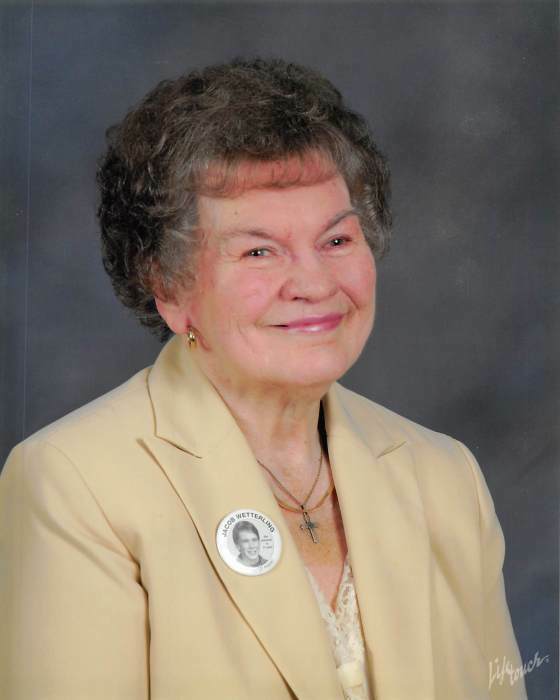 Judy was active in the Zion Lutheran Church, where she was a part of the Hannah Circle and LWML, as well as taught Sunday School for many years. Judy worked selling Sarah Coventry Jewelry for 15 years, and also worked a few years at Trades and Labor Credit Union in Albert Lea. Judy supported her husband’s work with the Albert Lea Trades and Labor Assembly. She stayed active in the union even after her husband’s passing. Judy was an avid card player, and enjoyed listening or playing music, watching football and basketball, or caring for her pets. If it was around election time, you could always find Judy and Richard at any Democratic gathering in the area! Judy was also an election judge for many years. Most of all, Judy enjoyed time spent with her grandchildren and great-grandchildren. Judy and her family were always involved in the Jacob Wetterling Foundation. Judy was always supportive of the foundation, participating in many fundraisers, wearing memorabilia for Jacob’s Hope, and was always supportive of the Wetterling family mission for the protection of all children. Judy is preceded in death by her husband, Richard Hagen; both parents, Erwin and Lillian Wetterling; granddaughter, Nissa Moles; a sister, Janet Pederson; and her nephew, Jacob Wetterling. Those left to carry on her legacy include her daughter, Brenda (Michael) Moles; granddaughter, Kristen (Travis) Greene; great-grandchildren, Ella and Luke Greene; siblings, Joan Wetterling, Jerry (Patty) Wetterling, and Anna Wetterling; as well as many loving nieces, nephews, extended relatives and friends. In lieu of flowers, memorials may be sent to Augusta University for the Nissa Bren Moles Music Scholarship at 1120 15th Street, FI-1042, Augusta, GA 30912.